Do trees grow new leaves through the growing season or are all the leaves budded out in the spring? Both! In temperate climates like ours, there are two common growth patterns. Some species exhibit a fixed-growth pattern where stem and leaf structures are formed in the bud during one growing season and after overwintering, the resulting shoot elongates into fully formed stems and leaves during a few weeks the following spring. The growth rate of these species is highly related to environmental conditions at the time of bud development. So a particularly wet August, for example, may translate to more shoots and shoots having more leaves the next growing season. This type of growth pattern can be observed in some species of maple and ash. Other trees, like aspen and birch exhibit a free-growth pattern. They also overwinter with buds containing tiny stems and leaves, but their buds can continue to grow vegetative structures that were not developed the previous summer. The growth rate of these species tends to reflect the environmental conditions of the current year. They can respond quickly to late-summer moisture by adding stems and leaves within the span of a few days or weeks. Transpiration is the process by which moisture is carried through plants from roots to small pores called stomata on the underside of leaves, where it changes to vapor and is released to the atmosphere. Transpiration is essentially evaporation of water from plant leaves. Transpiration is an important factor that drives the water movement inside a plant. As the water in a leaf evaporates, the empty space left in the leaf will “pull” the water molecules from roots and stem/trunk. Veins carry food and water in a leaf. 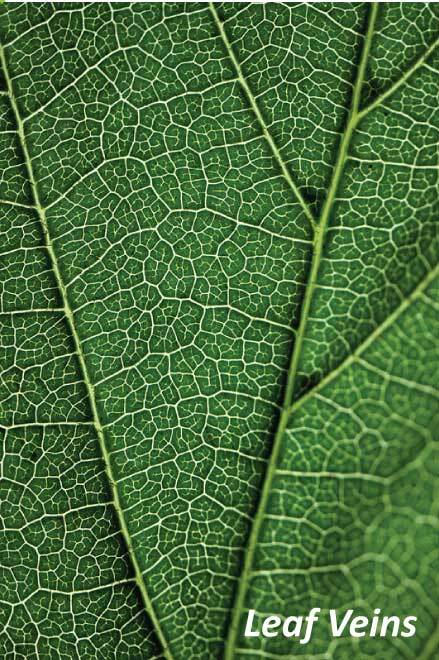 In most broad leaves, the veins form a netlike pattern, with several large veins connected by smaller ones. The smallest veins supply every part of the blade with water. 1. Mix the glycerin and water so that it is one part glycerin and two parts water. You only need enough to submerge the leaves – about one cup. 2. Pour the glycerin solution into one of the plates. You need just enough to cover the leaves. 3. Put the leaves in the bottom of the plate. 4. Put the other plate on top of the leaves and solution. 5. Put a weight of your choosing on the top plate. 6. Keep the leaves submerged in the solution for 2-6 days. 7. Dry the leaves gently with a paper towel. They should feel soft and pliable. As glycerin replaces the water in the plant’s veins, the leaves maintain the leaf’s texture and form. ← I’ve been hearing about the “comet of the century” ISON. What’s the big deal?